Wales continues to lead the way in business support to the agricultural industry with launch in Northern Ireland of a pioneering initiative developed by Welsh economic development company, Menter a Busnes. The first group of agricultural consultants in Northern Ireland have embarked on a Wales designed module that will help them implement support schemes to the farming sector. Combining expert business support techniques honed by decades of working in the Welsh agricultural industry, with accreditation by Aberystwyth University, Menter a Busnes have created a unique post-graduate module in Facilitation Skills. Menter a Busnes – which delivers the Welsh Government’s Farming Connect programme – have employed local facilitators to help deliver their business support services for over 25 years. During that time the company have built up considerable expertise in facilitation methods, and its collaboration with Aberystwyth University on a specific facilitation module will further strengthen Menter a Busnes’ offer to its clients as well as creating a blueprint for other parts of the UK. Initially designed for Menter a Busnes staff delivering the Farming Connect programme, the facilitation course has already achieved success at home. Over the past two years two groups of 12 facilitators have undertaken the course, with the second cohort of students having just received their results. The development of the course and its uptake in Northern Ireland is yet another notable achievement for the company which has an excellent track record of delivering programmes on behalf of Welsh Government and other organisations, often exceeding ambitious business targets. Implementing and developing the facilitation approach is key to successfully delivering business support where it is needed most, believes Menter a Busnes’ Chief Executive and course tutor, Alun Jones. “As we deliver services throughout Wales to a wide range of sectors including the farming industry in very remote areas, excellent local knowledge and facilitation skills are key to our success,” he said. Facilitation is instrumental in the company’s delivery of Welsh Government’s flagship Farming Connect programme, which is the envy of many other UK and European countries. Therefore in Northern Ireland, where the process of establishing Business Development Groups is underway to deliver knowledge transfer to its agricultural industry, drawing on Menter a Busnes’ experience of designing activities and delivery techniques was an obvious choice of training provider. Said Alun Jones, “The first intake of Irish students will complete the facilitation module over the coming months and others are lining up to undertake the training from within and outside of the agricultural industry. Farming Connect development officers in Wales have added to their business support expertise by undertaking the Facilitation Skills module developed by Menter a Busnes and Aberystwyth University. The intention is for these courses to be intensive, stimulating and challenging whilst also supporting and encouraging participants to develop both personally and professionally. The intention is that these short courses could be built upon over time so that learners are able to achieve either a Postgraduate Certificate (60 credits), a Postgraduate Diploma (120 credits) or a Masters Degree (120 credits plus dissertation). 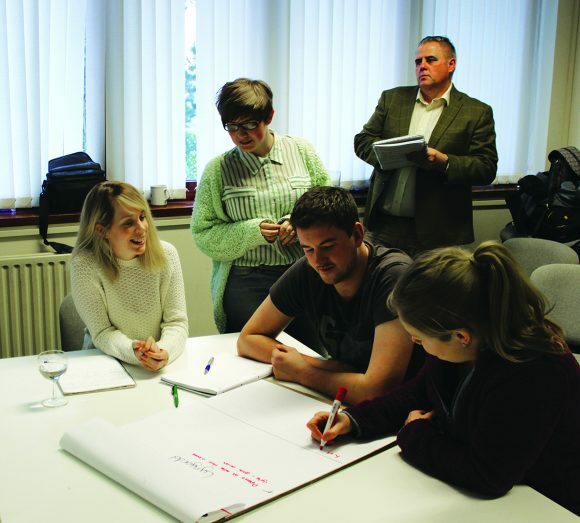 The first tranche of Welsh learners started the Facilitation Skills module – Facilitation for Organisational Leadership – early March 2015, and a second intake have since completed the course.